Christmas is only a mere 4 weeks away! While this probably doesn’t come as a shock to most of you, over here I am somewhat in denial. But I realise that the need to decorate is upon us once again, and you know I love nothing more than getting a little creative when it comes to decorating. So today I am sharing with you the prettiest, super easy wreath that you can hang above your Christmas table this year. When I say super easy, let me preface this post by stating the obvious – I am not a florist. Nor have I ever studied floristry or related subjects. In fact I’ve never been shown how to make a wreath and my floristry skills (up until now) have involved snipping stems and placing them in an appropriate vase. So, when I say that making this wreath is easy – it really is. No prior skills necessary. A professional wreath is probably going to be in a different league from the one I have created, but I like to think of this as a “do it yourself get a little creative with Christmas” wreath. All told it takes about 1 hour from start to fully finished hanging wreath. It does help to have another pair of hands when it comes to hanging it, but other than that, it’s easy peasy. 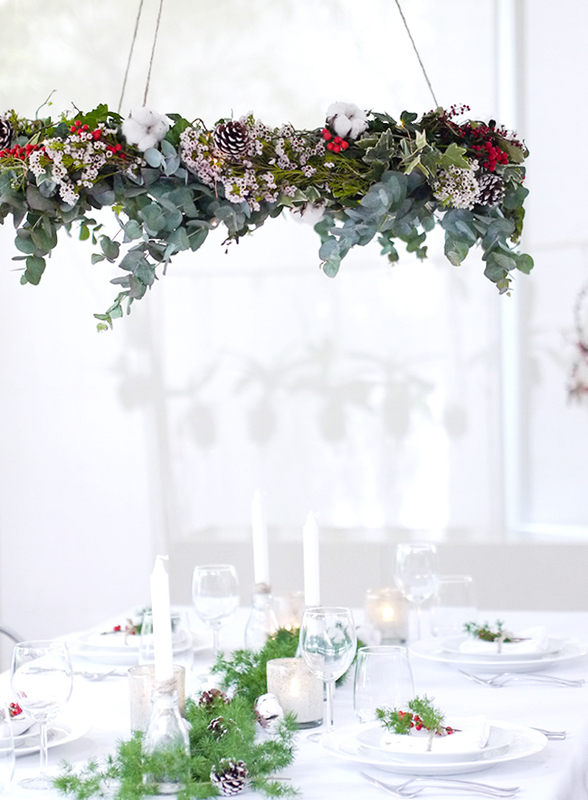 It is also an impressive and very beautiful way to decorate your dining area for Christmas – no one will ever know you made it out of a hula hoop (unless you tell them…which after a couple of glasses of bubbly you probably will – speaking from experience). Lay your hula hoop down on the kitchen bench. Take one pack of ivy, snip off the elastic that is holding the long strands together (but keep the ivy vines all together). Place the bunch of ivy on top of the hula hoop and using one strand of floristry wire at a time secure the ivy to the hula hoop in intervals (to do this you simply slip the floristry wire under the hula hoop and wrap it up and over the ivy a couple of times). Once your first pack of ivy is secure, repeat the process with the next pack of ivy until you have covered the top of the hula hoop (the bottom will probably still be visible). Carefully turn your hula hoop over so that the ivy is facing downwards and start covering what will be the bottom of your hula hoop-wreath with more ivy using the same method as above. Once you have done this, the hula hoop should be more or less completely covered in ivy. Don’t worry if there are a few gaps as these will be filled with your next layer of greenery. If you still have large sections uncovered then you may need more ivy. You now have the base of your wreath. Flip it back over so that the top of the wreath is facing upwards. Snip the flexible individual stems from the eucalyptus branch and gather into small bunches (about 5 or 6 stems per bunch) and using your floristry wire, tie the eucalyptus bunch over the top of the ivy (use the same method with the floristry wire, slipping it under the whole wreath and wrapping it up and over to secure). Work your way around the wreath adding bunches of eucalyptus until most of the ivy is covered. Let some of the eucalyptus hang down and the ivy curl away from the hula hoop to create interest. (Keep in mind that the wreath will eventually be hanging so add the eucalyptus to both the top and sides of the wreath). The wreath is now ready to hang. I used twine to hang it (and I needed a little fishing wire too as our ceilings are very high). I used a heavy duty removable hook (you need to make sure it is strong enough to hold your wreath). Have someone help you hang it so that you can get the wreath even. Once it is hung start adding your Christmas Wax flowers, red berries, pine cones and cotton. Create small bunches of Christmas wax flowers and tie to the wreath with the floristry wire – using the same method as the eucalyptus. The red berries, pine cones and cotton can simply be hooked through the ivy vines or existing floristry wire. Stand back every now and again to see where you need to add more and don’t forget you will need some pieces underneath as well. Lastly, wrap the wreath with twinkling lights that are battery powered. And voilà, just like that you have a beautiful hanging Christmas wreath. Let me know how you get on with this DIY wreath. I’d love to see your creations. And now that I’ve broken the seal on Christmas, expect a few more Christmas related blog posts to come!